The complete system provides all of the basic tools you need to maneuver and deliver spas and hot tubs. You will get the most benefit from each component when you purchase the complete system because the parts are designed to work together. The Complete SpaDolly™ Spa Handling System consists of the SpaDolly™ Trailer, the SpaKart™, the SpaJack™, 2 ratchets with straps, and the hand winch accessory with strap. These components work together to enable you to receive all of the benefits designed into the system. A large majority of your spa deliveries can be easily accomplished by 1 or 2 people using the Complete System. 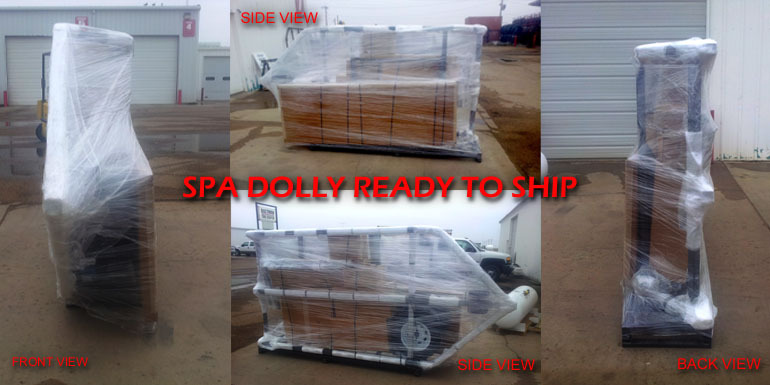 Our Complete SpaDolly™ Spa Handling System is packaged for motor freight shipping just as you see it here. The SpaDolly™ is assembled with the SpaKart™, SpaJack™, and accessories boxed and banded to the trailer.